Today, the Evanston Art Center display the new exhibition, about Junior & Senior High School Student. I’m a art student. When I was in the third year of high school, I started to contact art and painting. At that time, we wanted to draw the painting as realistic as possible and lay the foundation. Here, I saw a different understanding of art. Today was my first day volunteering here, although I have been involved with the Evanston Art Center before. 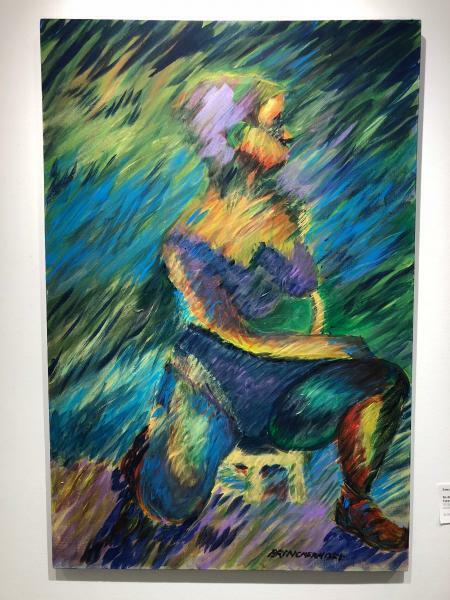 During my sophomore year, my peers and I worked with the Evanston Art Center and ETHS’s Emerge Leadership Program to organize a show that exhibited around 17 young Evanston Artists. I am currently a senior in high school, and when I entered the center on Tuesday afternoon I was greeted with the same welcoming and reassuring energy that I remembered from two years ago. At first this piece may give off a sense of chaos but the color placement and brush strokes give the composition a cohesive look and sense of movement. The bright red color surfaces strongly when focused on but fades away to emphasize the blue and green tones around it. The longer I look at it, the more changes in my eyes. The little patch of seafoam green stands out to me as geometric and abstract and catches my eye through it’s contrast with the surrounding shades of blue and yellow. My name is Zane, a senior student from Ningbo University in Ningbo. I major in display design. I’ll act as an intern in this beautiful Evanston art center for two months. Hello. I’m Jeffrey from Shenzhen University, China. For three weeks, I will be in Evanston Art Center as an intern. Here I’d like to talk about two wonderful artwork both about Lake Michigan. We loved being a part of Comcast Newsmaker's segment with Ellee Pai Hong! Paula Danoff, our very own EAC newsmaker, had a great interview about EAC's various classes, exhibitions and outreach programs. The Evanston Art Center is home to one of the largest art shows in the Midwest, the Evanston + Vicinity Biennial Exhibition. The exhibition was juried by Sergio Gomez, Curator and Director of Exhibitions at the Zhou B Art Center; Aron Packer, Owner and Director of Aron Packer Projects; and Therese Quinn, Associate Professor of Art History & Director of Museum and Exhibition Studies at the University of Illinois in Chicago. These three jurors had the opportunity to award three jurors choice awards and three monetary awards to the Biennial participants. Sam, our EAC Intern and a sophomore at Rhode Island School of Design, writes about his favorite artwork on display in our newest exhibition, Design is a Verb: Chicago Sculpture International Biennial curated by Alyssa Brubaker. My name is Terry, a freshman from Fudan Universty, Shanghai. I’ll act as an intern in this brilliant Evanston Art Center for three weeks. The moment I walked into the Art center I knew I would love it. I was greeted with a warm hug from Paula, who generously and kindly took me under her wing. Art pieces glimmered from sunbeams, and the big roomed slowly became a meeting pace for friends to catch up. Everyone I met greeted me with a warm welcome, and big smile. My nervousness soon disappeared. Hola! My name's Marina and today is my first day as the Community Outreach intern. It's a crisp Monday in March and walking into the art center I was met with a warm welcome. After walking past the front desk, I was able to take in the gift-shop and main exhibition gallery. Interestingly enough I arrived while they were in-between exhibits! The white walls were bare yet gleaming under the track lights. The energy in the space was tranquil. It’s my last workday and I really treasure the last few hours in Evanston Art Center. It’s really a good place and I do enjoy those unforgettable days! I’ll never forget the working skills that I’ve gained here and I’ll also never forget those impressive artworks. Time flies, it has already be to time to say goodbye to everyone. So I walked around and took a visit of the Evanston Art Center again. 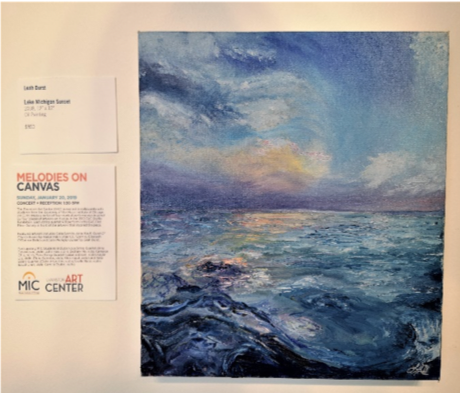 Jake, our EAC Intern from Lake Forest College, writes about our upcoming exhibition by artist Barry Lorberbaum on display in our Second Floor Gallery. As flowers need sunshine, we need art to enrich our life! In Evanston Art Center, we can see all kinds of art works. Here is a painting -- Angel. I love it. The cloud in the middle is a symbol of an angel and it is in oceans of books. I think the painter wants to convey that knowledge creates an angel. Anne Guitteau, our second SHAPE OF NOW Artist-in-Resident, collaborates with Katrin Schnabl building a multi-dimensional knitted environment. Using discarded plastic that has been carefully cut and repurposed into yarn, the traditional craft of knitting becomes the vehicle for a conceptual exploration of space, environment and body. Having both independently knitted with plastic before, this residency provides a unique opportunity for a larger-scaled investigation. If you are looking for a place to visit and enjoy the art in Evanston, Evanston Art Center (EAC) must be the best choice for you. You can have exhibitions, classes and events in the EAC. So let’s just visit the Evanston Art Center in the first view. We loved being a part of Comcast Newsmaker's segment with Paul Lisnek of WGN News! Paula Danoff, our very own EAC newsmaker, had a great interview about EAC's various classes, exhibitions and outreach programs. Thank you to Comcast Newsmakers for inviting the Evanston Art Center to participate in this outreach program! Far From the Front Lines is a collection of 22 artists whose work reflects the Israeli-Palestinian conflict, and is currently on exhibit at the Evanston Art Center. 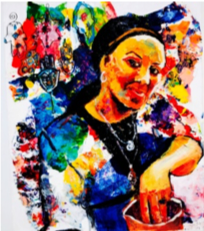 I recently took the opportunity to sit down with the curator, Dorit Jordan Dotan, and learn more about her and her show. Rafael E. Vera’s installation TBD… nevermind is currently on display at the Evanston Art Center as part of the Evanston + Vicinity Biennial: Group Exhibition. I recently had the opportunity to speak with him about the shift in his work that led his art practice in this new direction. Katherine Nemanich’s piece Duality 1 is composed of collage and ink on paper. Though only two colors are featured in this piece - black and white - the intense contrast of flat ink next to 3D paper construction results in a simplistic yet incredibly engaging final product. If we look at the natural world around us, whether it is the dark space behind a blue sky or the abyss beneath a glistening surface of water, darkness tends to fall behind and light is seen in the forefront. JASON BROWN is a visual artist who investigates the ideas of place and space and how they intersect with identity through his 2D work in both public and private spaces. As The Zip Code Kid, he has three pieces in the Evanston Made show, each representing the main zip codes of Northwestern. During a visit to the Evanston Art Center, we were able to sit down and chat more about the ideas behind his work and his unique study of how we are formed by the places we inhabit. IMANI DAVIS: What was your inspiration for creating this art piece? RITA SHIMELFARB: It was driven by the idea of both separation and connection between Love and Faith. Which sustains which? When one collapses, will the other one pick you up and hold things together? Are they two sides of the same coin? Sarah Kaiser’s piece titled Quite a Pair represents a pair of pears laid down among an undefined horizontal and threw to an infinite sky characterized by weightless clouds. This painting is principally an oil painter, and the jewel-like colors in the work were made by a glazing technique. It’s brightness is build up by transparent veils of color and a deep plasticism is reached trough the clearness and well defined profile of the subjects. 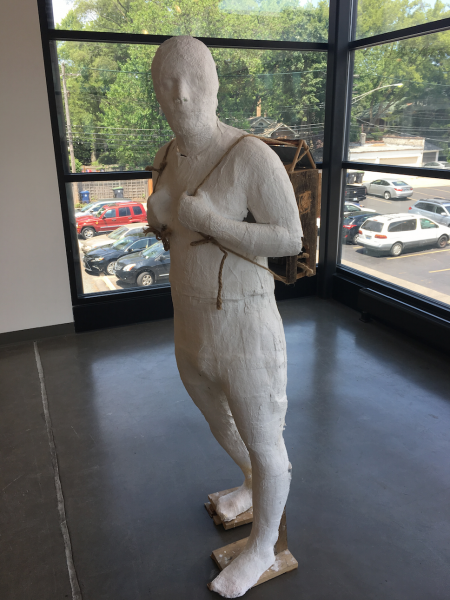 Javier Jasso’s installation based sculptural work at the Evanston Art Center examines how humans respond to their surroundings, and their natural inclinations to seek a sense of home. The materials utilized by the artist mirror those used in construction ; metal, plaster, concrete, plastic and wood. At the Opening Reception of Nature vs. Nurture, curator Younsoo Kim Flynn gave a talk about her research and process on curating this exhibition, which aims to redefine the complex relationship between natural and urban landscapes. It started as a question or an experiment to gain multiple views from artists I respected on how they perceive and experience nature while living in highly urbanized environments. Over the past week, some of our Evanston Art Center interns interviewed an artist from our Evanston Biennial exhibition that caught their eye. Learn more below about: Tamara Fraser, Heather Green, Mary Petrine Livoni, and Rachel Sanfilippo. Over the past week, some of our Evanston Art Center interns interviewed an artist from our Evanston Made Exhibit that caught their eye. Learn more below about: Vanessa Filley, Stephen Murphy, Kristen Neveu, Jevoid Simmons and Dorit Jordan Dotan. First is an interview with Lisa Degliantoni, the creator of Evanston Made. How did Evanston Made start, what was the inspiration for the project? Pedro Velez is the first of six in house resident artists participating in the Evanston Art Center’s Society! Artwork In-Residence Program. Pedro is a multidisciplinary artist whose work merges his interests in journalism and art criticism into visual essays that take the form of large sculptural paintings, photographic collages, and limited edition posters. Velez’s work focuses on many topics branching from race, politics and other aesthetic concerns. We loved having Jon Hansen with You & Me (WCIU) at the Evanston Art Center this week. Watch him create some art in our Ceramics Studio with our very own Mollie Morris and Paula Danoff. Image: Sheila Oettinger, “Boundaries of the Mind." It is easy to overlook the power of hand and body gestures in an age of instant communication. Today’s society relies on texts, tweets and posts. But Sheila Oettinger’s sculpture exhibition, “A Life Making Sculpture in Clay,” at the Evanston Art Center was a reminder of how compelling the human body is. “My work reflects a long standing commitment to explore new and innovative ways to represent the human figure in sculpture,” Oettinger says. It is a point made clear in her recent exhibition of about 50 clay sculptures. The one-floor show featured several sculptural series, including her figurative sculpture reliefs and contemporary realism sculptures. Together, the series revealed the artist’s lifelong fascination with the human figure. At the same time, it was interesting to see the transition in her work. This proved to be the most striking aspect of the show. America has long been referred to as a melting pot. This fusion of diversity is reflected in Chicago, America’s third largest city. You may work with Poles, Germans or Asians, then dine at one of the many Middle Eastern, Chinese or Mediterranean restaurants found throughout the city. On any given day, Chicagoans may feel blended into our amalgamated world. 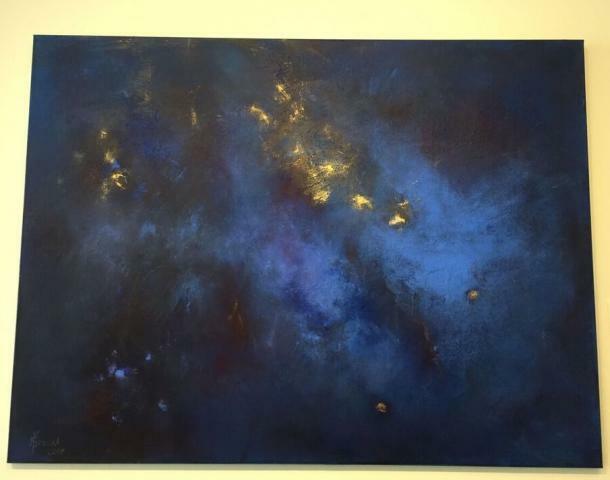 But examining Verena Brassel’s paintings in her exhibition, “Expressions From Ancient Roots: A Spiritual Journey,” at the Evanston Art Center (EAC), just north of Chicago, reveals a fresh perspective on the subject of merging cultures and histories. If you are looking for distinct gifts this holiday season, look no further. 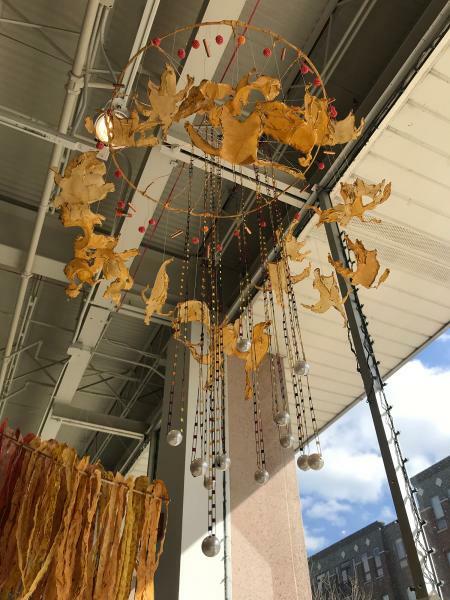 The 13th annual “Winter Arts & Crafts Expo”—one of Chicagoland’s largest craft shows—opened this past weekend at the Evanston Art Center (EAC). Running through December 20th, the Expo features the work of more than 100 artists and craftsmen. The holiday music playing in the background will spark your holiday cheer, while meandering between tables filled with jewelry, ceramics and glass pieces. Gaze up to see the innumerable artworks gracing the walls. Although there are plenty of items to choose from, the arrangements are not overwhelming. Rather they are tastefully organized, and highlight some of this year’s most striking pieces. On November 6, members of the Evanston Art Center (EAC) and their guests are invited to attend the upcoming Art After Five event, a private art collection that includes Pre-Columbian art at a Highland Park residence. Other collection highlights include African, Oceanic, Southwest Asian and Native American art, along with antiquities and Chinese pieces. It’s an evening merging art and architecture, since this extensive private collection is in a home designed by architect John S. Van Bergen, who worked for Frank Lloyd Wright for several years. 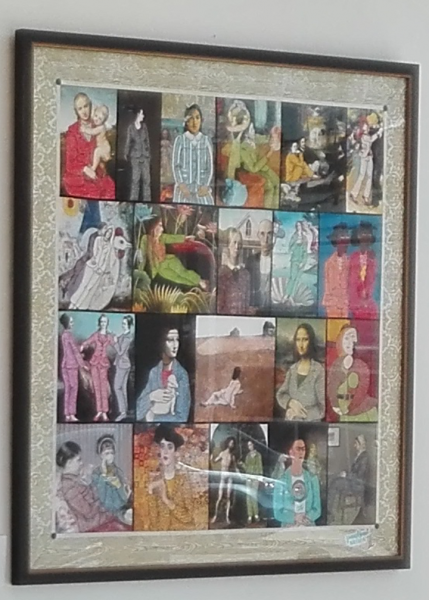 Harold Bauer, a Trustee and student at the EAC, came up with the idea of showcasing artists from around the state. Then, the EAC contacted Illinois-based universities, each of which selected two faculty members and two students to participate in the exhibition. Contributors hail from a dozen universities, from Knox College to Lake Forest College. Cara Feeney, curator of the show, explained the focus was to open up the exhibition to universities outside Chicago. “It just seemed a little bit more interesting to have these artists that we don’t know and bring them into our community here,” she added. Example of an Ikebana arrangement. Photo: courtesy of Yuko Inoue Darcy. The Evanston Art Center offers several Ikebana courses taught by Yuko Inoue Darcy this fall. Ikebana, a centuries old Japanese art of flower arranging, transforms plant and flower materials into beautiful and elegant expressions. Students taking one of these classes will create arrangements and learn skills relevant to this practice. Partial exhibition shot on the first floor of the EAC's "Studio Exhibition." 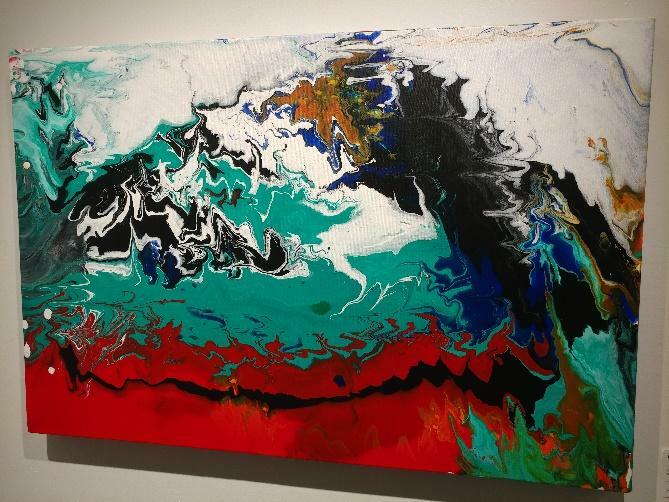 The “Studio Exhibition,” featuring an amalgamation of artwork produced by students of all levels, opened last weekend at the Evanston Art Center (EAC). This two-level exhibition includes an impressive range of work from students that recently completed an EAC class, and features paintings, sculptures, printmaking, jewelry and ceramics, among other media. Although the show reflects the EAC’s many course offerings, it also emanates creativity and offers visual variety for viewers. Evanston Art Center from Evanston Art Center on Vimeo. Take a little video tour of our new space. We'd love for you to come visit and take a class. Fall registration just opened, CLICK HERE to see a full list of classes and to sign up. This Thursday, August 6, 2015, the Evanston Art Center (EAC) will host its first ARTiculate event. Geared towards young professionals, ARTiculate events take place the first Thursday of each month and feature art-oriented activities: artist talks, films or small exhibitions. On Thursday, attendess will enjoy a short talk by sculptor Victoria Fuller, along with refreshments, at the EAC from 7 to 9pm. On Sunday, the Evanston Art Center (EAC) hosted the Grand Opening of its new location: 1717 Central Street. After moving in May, the EAC has settled into its new home. Classrooms are filled, updated programming has been added and there is a buzz of excitement in the air about upcoming exhibitions and events this fall. The Opening, which spanned two levels, featured stands selling jewelry and ceramics, music, dance performances, ice cream making and demonstrations from some of the various courses the EAC offers. The variety of presentations and hands-on activities that took place at the Opening parallel the EAC’s guiding mission: fostering the appreciation and expression of the arts among diverse audiences. 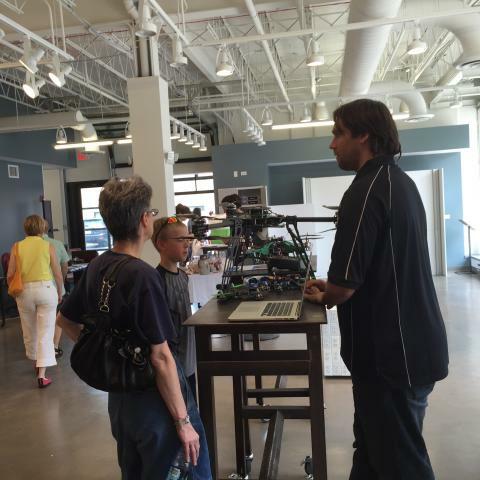 Don Miller, from Mad Lab Industries, displayed drones and discussed the drone camps and classes the EAC offers. Miller explained that Mad Lab Industries created a buildable drone kit for Einstein by Design, who has partnered with the EAC for its drone camps for kids. During these camps, kids have the opportunity to put together and fly a small drone; at the end of the camp, kids can take their drone home. Why drones? This is just one way the EAC is merging technology with art. The Evanston Art Center (EAC) unveiled “Hybrid’s Paradise” in June, the first exhibition in its new space. On view are photographs, paintings, digital works, drawings and sculptures by more than 25 Chicago-based artists in an exhibition that spans two-levels. Curator Sergio Gomez’s decision to include a mélange of artists and media helps clarify the hybrid theme. “Adapting to new evolving environments is key to surviving in today’s world,” says Sergio Gomez, a Chicago-based director, artist and curator of “Hybrid’s Paradise.” He is right. Given the influx of changing technologies and diverse cultures, learning to adjust is essential in both art and life. The EAC’s new space and this current exhibition recognize this very fact. That said, Gomez demonstrates “the experiences of living in a hybrid world,” as he puts it—fitting for the EAC’s new collaborative and multi-disciplinary space. Sarah Kaiser-Amaral's "Fear." Photo: courtesy of the artist. Kaiser-Amaral’s oeuvre, which includes pairings of figures, animals and patterns, conveys the relationship between humans and nature, brevity of life and persistence of time. However, her new body of work focuses on boundaries. It’s a fitting topic that applies to most aspects of life. There are boundaries in social and political spheres—both physical and invisible—as it relates to immigration, race, gender and globalization. Others include boundaries at work, home or those we set upon ourselves. But how does the artist see it? Bill Floyd, EAC Trustee and Vice President of the Board. 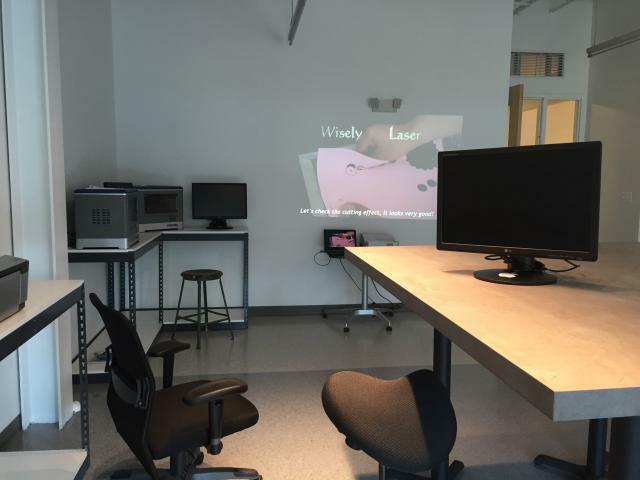 The Digital Media Maker Lab is a compelling feature at the Evanston Art Center’s (EAC) new location (1717 Central Street). Bill Floyd, an EAC Trustee and Vice President of the Board, and Rob Mulholland, EAC’s Operation Specialist Project Manager, describe what the Digital Media Maker Lab is, what it offers and what it aims to do at EAC’s new location. Partial shot of EAC's Digital Media Maker Lab. To fully appreciate today’s Digital Media Maker Lab, it is important to have a context. Floyd explains that EAC originated in fine arts: 2-D drawing, painting and printmaking. Over time, digital art and media were added to EAC’s curriculum and practice to include digital editing suites, photography, ceramics and metalsmithing. Now in its new space, EAC is enhancing its curriculum once again. Sergio Gomez, artist, curator, director and co-founder of Art NXT Level. The Evanston Art Center (EAC) is offering two exciting workshops this summer: “Ignite Your Art Practice from the Inside Out” and “7 Photoshop Techniques for Artists.” Both events are geared towards artists to help their professional practices. Eleanor Spiess-Ferris, a Chicago-based artist and teacher at the Evanston Art Center (EAC), has a new exhibition on show at Angela Meleca Gallery in Columbus, Ohio, “See No Evil.” Her gouache on paper and oil paintings are displayed near Chicago-based artist Nicole Gordon’s exhibition, “Reoriented,” also at Angela Meleca Gallery. Human-nature is a common theme for Spiess-Ferris. “I have always been interested in the environment and how one needs to nurture our nature,” she says. “I like to play with the human element and nature in a relationship with each other.” Take “Garden,” for instance, which depicts a morphed figure: part woman, part cactus. Although the cactus suggests a nod to her New Mexico birthplace, the image is an eerie visual representation of humanity and nature merging. “Knob Job and the Power Box." Photo courtesy of Victoria Fuller. “Adapting to new evolving environments is key to surviving in today’s world,” says Sergio Gomez, a Chicago-based director, artist and curator of the upcoming “Hybrid’s Paradise” exhibition at the Evanston Art Center (EAC). 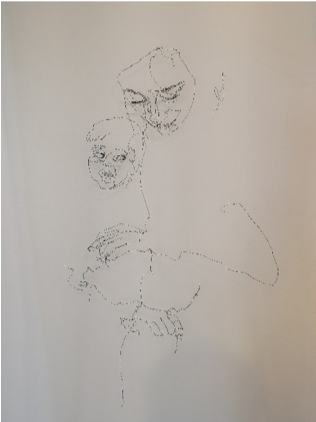 This aptly titled show brings together the interconnectivity found in today’s changing society in conjunction with EAC’s new versatile space and approach. Rob Mulholland, Operation Specialist Project Manager. The Evanston Art Center (EAC) welcomed Rob Mulholland to its staff in March as EAC’s Operation Specialist Project Manager. Programming is foundational to his work: assisting to create “an environment for members, students and guests to have the opportunity for creative experiences and personal growth,” as he describes it. According to Mulholland, his primary duties include researching, evaluating current programming and recommending new programming for the EAC Maker Lab, which features innovative and design experiences, movement and yoga initiatives and the culinary arts center. Mulholland joins at an exciting time: EAC is moving to its new location at the end of May (1717 Central Street in Evanston), and updating its programming. Upon this move, EAC will expand its courses this summer; its offerings in the visual arts will be supplemented with cross-disciplinary programs in technology, engineering, design and new media, among others. Change is in the air at the Evanston Art Center (EAC). The most exciting change this spring is our move to 1717 Central Street in Evanston at the end of May. The new location features a contemporary design, open space and a coffee shop to facilitate community interaction. Its central Evanston location and updated programming will make the Evanston Art Center a place where creativity meets community.